The economy appears to have hit a soft patch this winter, but it's too soon to worry, according to Federal Reserve Chair Janet Yellen. She blames most of the recent weakness on the weather. Over the last month, government data have pointed to weak job growth, as well as declines in retail sales, new home construction and manufacturing. But here's the big question: If weather is not fully to blame, and the economy is indeed weakening, what will the Fed do? The central bank is currently in the process of winding down its bond-buying program -- a process Wall Street has nicknamed "tapering." Cue a question from New York Senator Charles Schumer: "If it's not mostly weather, would you consider pausing or changing the rate of tapering?" 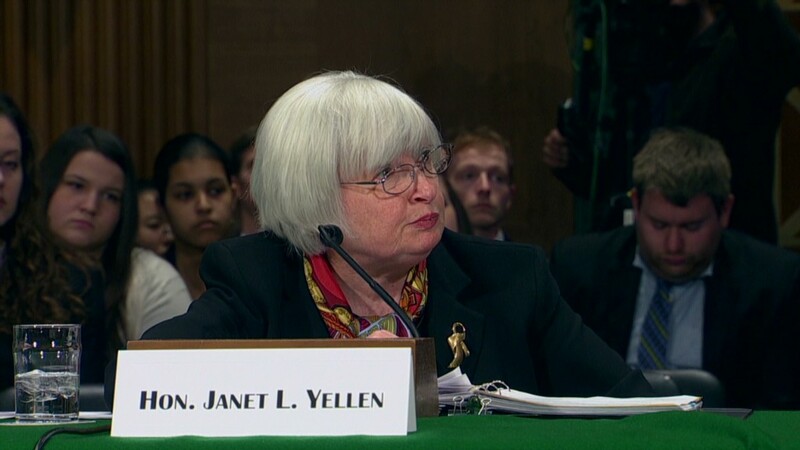 he asked Yellen. 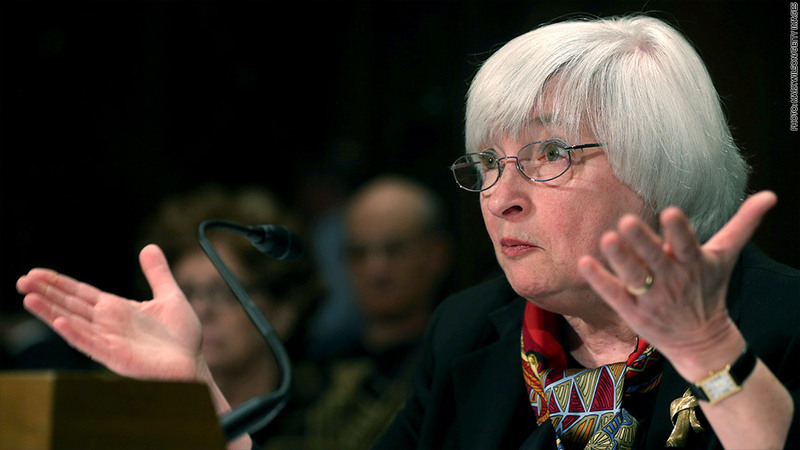 She replied with what has become a standard line for Fed officials, often uttered by Yellen's predecessor, Ben Bernanke. "Asset purchases are not on a preset course," she said. "So if there's a significant change in the outlook, certainly we would be open to reconsidering, but I wouldn't want to jump to conclusions here." So it seems the Fed could put the taper on hold, but only if the numbers start pointing to a lasting slowdown in economic activity. By the time the central bank meets again in mid March, it will have received February reports on jobs, retail, construction and manufacturing -- but these too could be skewed by blizzards. It's not until its late April meeting that the Fed is expected to have a clean set of data unaffected by weather. In the meantime, the Fed is widely expected to continue tapering at a steady pace, and Yellen seemed to confirm that plan Thursday. "We expect to continue reducing the pace of purchases in measured steps, which would mean ending completely the purchases, winding down and ending some time next fall," she said. In the rest of her testimony, Yellen once again stressed her deep concern for Americans grappling with bouts of long-term unemployment. "These are spells that are very damaging to families, put great burdens on families both in terms of income and even health burdens ... burdens on children and marriages," she said. For the last year, the Fed has said it's waiting for a 6.5% unemployment rate before raising its key interest rate. The unemployment rate came awfully close in January, when it fell to 6.6%. Minutes released from the Fed's January meeting have since shown that officials are discussing a new communications strategy, given the unemployment rate has neared their goal but the economy still seems weaker than they would like. Yellen addressed those concerns Thursday, by stressing she's looking at qualitative data and not just a numerical trigger. The unemployment rate alone, she said, is "not a sufficient statistic to measure the health of the labor market." The Fed is also monitoring the numbers of part-time workers who want to work full-time and Americans who've been unemployed for more than six months. Meanwhile, low inflation gives the Fed some leeway to continue stimulating the economy through low interest rates. The central bank typically aims for inflation around 2% a year, but lately, it's been hovering around 1.2%, after stripping out energy and food prices. "Inflation is running well below our 2% target ... that gives us ample scope to continue to try to promote a return to full employment, and we're committed to doing that," Yellen said. Yellen's prepared remarks were, for the most part, identical to those she delivered two weeks ago before the House Financial Services Committee. The Federal Reserve is required to report to Congress on monetary policy twice a year.